As an RYA Recognised Training Centre we exist to train and educate boaters at all levels. The RYA Yachtmaster qualification is an aspiration & goal for many leisure boaters and also a pre-requisite for progression for many professional boaters. We see many candidates from both groups coming through Mendez Marine, most with all the pre-requisite knowledge and practical skills and occasionally a few without. The RYA Yachtmaster Prep course is not a teaching course. It is designed to polish the navigation & practical skills of YM candidates so that they are well prepared for the exam. We would advise all RYA Yachtmaster Prep candidates to be really honest with themselves when assessing their ability and suitability for attending the Prep course. Are your navigational skills and boat handling skills at the level they need to be to take the exam? RYA Yachtmaster candidates can be tested on any subject within the RYA Motor Cruising Syllabus during the exam. You will be expected to demonstrate in depth knowledge of theory subjects and a high standard of boat handling, briefing crew, prepare detailed passage & pilotage plans, complete blind Nav exercises by day or during night passages, carry out man overboard exercises, pick up buoys and be tested on IRPCS etc. the list is endless! This cannot be taught in four days, Any experienced Yachtmaster Instructor will be able to tell within minutes if you have the required experience and skills required. 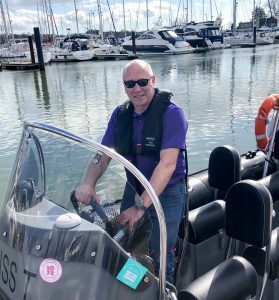 If your experience of helming twin shaft boats is limited then you will probably need a day or two of close quarters, boat handling practice in order to get you to the required standard. You should be able to handle the boat in confined spaces, with a string tide running, strong winds and with only one of the two engines functioning. Refresh your navigational skills, course to steer, EP’s and DR’s, tidal heights, bridge clearances, weather, RADAR, IRPCS, Lights, Day Shapes and sound signals. Much of this you can probably do yourself with some self study, revision. If you need help please ask! Whether sitting the full RYA Yachtmaster (Power) Exam or doing the Sail to Power conversion you need to be aware that this is a Pass or Fail exam.